We finally made it to the finals of the After Hours Gaming League (AHGL) playing against the highly favored Qualcomm. We started to expect mid-way through the season as our team was doing so well, but on a more personal note I was so nervous before the games that I had completely forgotten to eat. My hands were shaking, my heart was racing, my fingers were cold, and I was scared to death that we would finish the season 13-1, dropping only our last and final game to Qualcomm. As we went through bans in the first game we were really surprised by them. We were expecting their bans to be Pantheon or Lux, LeBlanc, and Kog. However, in the first game they banned out Xin Zhao, Thresh, and Lux. Granted, Czarni does have a 75% win rate with Xin in Solo Queue, but as we’ve previously discussed, you can’t ban out the Czarn Dog! We focused on Pointblanket with our bans, to give Jake the best opportunity of coming out of top lane ahead and useful. We banned out Irelia and Riven, which meant Pointblanket would play Elise. Then we banned out Leona so that KrzyMoose wouldn’t have his strongest support in bottom lane. That back-fired just a little bit. We got just about every pick that we wanted, including taking the Kayle pick from Qualcomm. They must have really thought that was cute because they did the same to us in the second game. Laning phase was really hard on our team. In bot lane we couldn’t win trades because the healing power of Sona just overpowered our ability to poke. Mid really wasn’t a great matchup for Iggie because we first-picked Kayle and let them move in with a counter pick. We also knew that top would get counter picked because we were having Choppes play as Jayce in the top lane to guarantee our ability to poke in the mid game. This was a huge risk because by letting Pointblanket counter pick into Jayce was quite dangerous. Our hearts sunk when we saw their team comp start to appear; multiple area-of-effect ultimates and just layered damage. Qualcomm was designed to win team fights, and win team fights they did. We fell behind quickly in kills, and more so in gold. All of our attempts to group were thwarted by Qualcomm’s insanely strong AoE comp. We lost a couple fights, but wanted to keep the pressure up. We almost lost to a Qualcomm Baron attempt, but their tanks had died in the team fight earlier, and their team was too vulnerable to the high damage of Baron. After we respawned we wanted to force a fight at Dragon. We actually got a clean Dragon kill and I saw the enemy team trying to pick up their blue buff. I rushed right in there, and watched as they just disengaged through their jungle. Qualcomm split to mid lane, but we had creeps pushing up bot, so we decided to shove hard. We started beating on their tier two tower, and saw that they had decided to barrel down mid. We knew we had to base race them. The call was made to race, and race we did. Looking back on this race there is almost no reason we would win it. Qualcomm had less attack speed on their champions than we did, but once they factor in the bonus attack speed from Jarvan IV’s Demacian Standard, there’s no reason they weren’t melting our towers. I was focused solely on taking the enemy base as quickly as possible. However, Tiffany sitting behind me said “you’re winning this.” We could see that someone on the enemy team was trying to recall. We already had the inhibitor and we had enough of a push to win the game, the only thing standing between us and the win was a nasty platinum spider. Elise purchased Homeguard upgrades for their boots and came speeding out towards us. Before she had a chance to react Shen landed a perfect taunt which was followed up by a Morgana binding. Elise was instantly melted. We turned our attention to the base towers and watched the enemy team trying to recall. We had both Nexus turrets down when the enemy team came pouring out towards us. However, they focused their attention on my team just to the left of me. After the Orianna ball came out I took a slight step to the side (a new tactic I call side-stepping) and watched as three members of my team went for a fun ride on Orianna’s ball. However, the Nexus was low enough that the game was over. A few more autos finished it off, leaving three members of my team below 10% health. After a roller coaster of action and team fights the whole thing came to a close very suddenly after a quick base race! We lucked out in the first game of the AHGL finals, and we knew it. Now we had a huge sigh of relief knowing that we were one game up in the grand finals of the AHGL. Now I started to worry that we won while behind in kills and gold and virtually every lane lost, so if we don’t get lucky again then we run the potential of losing two games in a row and still placing second. The game could be decided in champion select. When Qualcomm came out of the gates and banned Kog’Maw, Xin Zhao, and Jayce we got very excited that we would be allowed to run Pantheon, Lux, and LeBlanc. However, once Qualcomm first-picked Lux our hopes were shattered. We went into a bit of a panic and had a quick run-down of what lanes we could do. We considered other supports with Pantheon in the bottom lane, but none of them sounded efficient or practiced. Instead, we saw the Thresh pick and Czarni asked if he could run Hecarim and I responded with “Oh please, yes.” We had a fun Shadow Isles theme started for the second game. We ended up picking five champions who could jump over walls. With this high mobility comp we felt very strong playing against five champions who lacked a targeted gap closer. Soniv and WaveOfShadow (our loving casters) made a comment about the Pulsefire Ezreal skin. Let me defend myself a bit here. Nubehound sat out this game, but he was at my house to watch me play. He had never heard the Ezreal sound files before. He was thrilled that Ezreal didn’t sound like a complete jerk in the Pulsefire skin. As the person playing Ezreal I love using the Pulsefire skin because, well, let’s be real, every now and then he just floats off the ground. However, I also have to listen to all the dumb stuff that he says. However, with the Pulsefire skin I didn’t have to hear “who needs a map?” once. Not a single time. Oh, thank goodness! To me, that is value! We actually ended up winning the lanes this game. 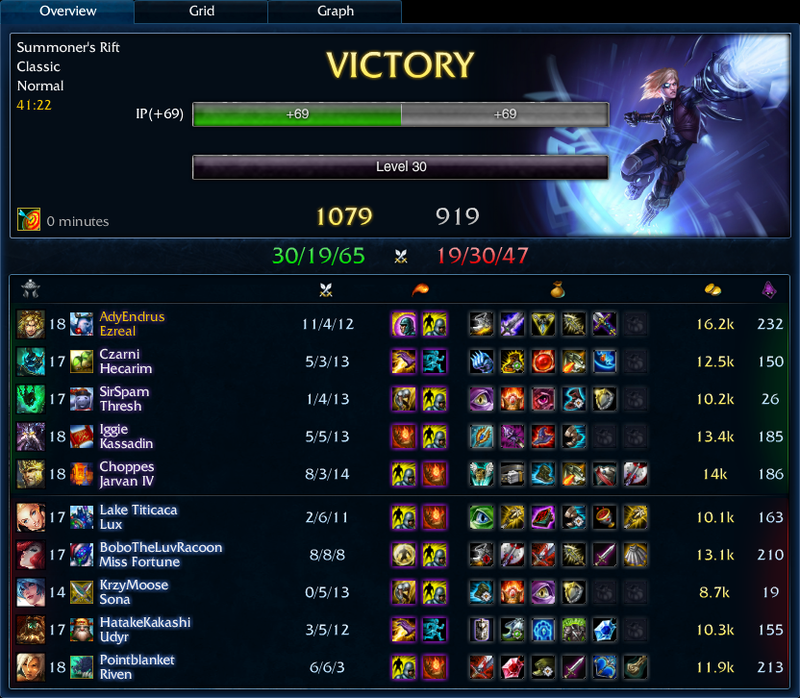 Even though I managed to die first blood to Miss Fortune, I still was ahead in money after the laning phase ended. I was also up 30-40 creep score on MF. Choppes managed to beat Riven and force her back a few key times. Iggie got to the point where he was just picking on that poor Lux. Lanes were doing well, and our jungler was rolling, so the game was looking promising. I finished my Blade of the Ruined King early enough to feel like it was worth it, and then figured I’d start building Trinity Force because Phreak always promised me that with it I would deal tons of damage. I also like the bonus damage on Ezreal because he uses abilities frequently enough that it could come in handy, and if we need to take towers in a hurry then the added damage from the Trinity Force proc would definitely help. We won a team fight in the enemy’s jungle, but were too low to move for Baron. When Iggie and I retreated we moved up past the enemy team’s blue golem and positioned ourselves out of view to wait for Qualcomm to make a move on Baron. The rest of Team SecurityMetrics showed up on Baron and moved towards our location. We waited patiently until Miss Fortune stuck her head out around the corner. When she showed up to the fight Czarni charged in to confront her. Choppes followed him up and Iggie got into the fray to burst her down as well. However, Miss Fortune threw out her Barrier and survived the burst from all three of them, and managed to escape until she was chased down by Choppes. However, Iggie had to escape over the blue buff wall, Choppes fell in the pursuit, and Czarni escaped with only a few hundred HP. SirSpam threw down his ultimate to allow the rest of us to escape, but went down in the aftermath. This left four members of Qualcomm to take a Baron almost uncontested. However, our pink ward was still showing the inside of the Baron pit. I stepped down into the mouth of the Baron pit to poke at Qualcomm with Mystic Shots and was tagged by a Lux Light Binding. Riven, Sona, and Lux all came for me, so kited back around to the back of the Baron pit. However, Iggie had time to get back to the Baron pit, and Czarni was laying in wait on the backside of the pit. When Iggie showed up he immediately went aggressive on Lux and very quickly finished her off from about half health. Qualcomm had no response to the death of Lux, so they came pouring out of the Baron pit. They chased after the low health Czarni, but I quickly got their attention by running down towards their base while throwing some spells back in their faces. I had the blue buff, so my cooldowns were reduced and my mana was practically endless. When Sona, Udyr, and Riven finally got close to me near the wolf camp I blinked over the wall to where blue buff would have been and headed back up towards Baron Nashor. Iggie and I saw Miss Fortune pushing top lane out, so we both blinked in on her and bursted her. I landed a long Mystic Shot to pick up the final blow and secure the kill. After that burst I had enough for Infinity Edge, so that was a perfect time to run back to the base. When we returned we showed up to fight Baron and Qualcomm couldn’t react quickly enough. We dropped Baron and then brought the fight to them. We sieged the base and I had one of the most fun plays of the season. As we were retreating I saw that Miss Fortune was walking up to the wall of the base to clear out the creeps. I saw that I had reduced cooldowns from blue buff, so I fired my ultimate over the wall and immediately followed up with something I call “going ham” which involves Arcane Shifting into the enemy base. I nuked Miss Fortune down to about 10%, but I was not expecting her barrier to be available. So now I’m standing in the enemy team’s base and I’m basically on cooldown thanks to what I did to Miss Fortune. She ran north, out of my range, so I stepped back towards the base wall to make my escape. 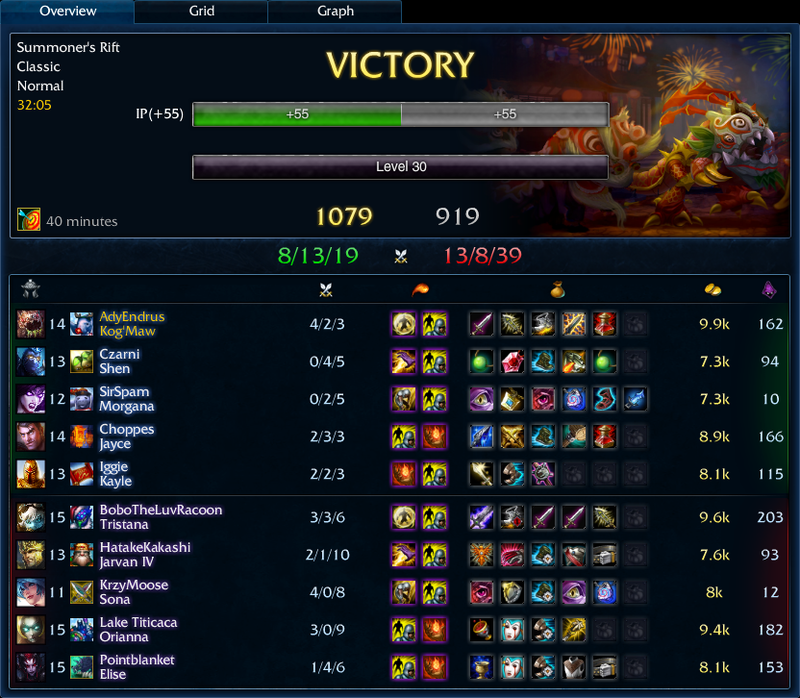 However, Udyr stepped on the Thresh lantern that was thrown for me, so now I really had no escape. I saw that my only option was to stand and fight. Luckily, it was me versus a fleeing Miss Fortune, a full health Udyr, and a full health Lux. I turn my attention to Lux, drop her, but in the process of doing so I spammed enough Mystic Shots to reduce the cooldown on my Arcane Shift. See ya, Udyr. I jump back over the wall to the lovely sound of Jarvan IV picking up the kill on Miss Fortune with his ultimate. Now we really needed to get out of there, as we had over-stayed our welcome. We started to retreat, but Udyr and Riven were just too fast. I saw that it was hopeless. I was low health, all of my allies saw the enemy in pursuit and we figured we were throwing this game. Just as we reached the wall near Wraiths in mid lane our beloved Choppes made a valiant move. He dropped his flag back behind the enemy team and pulled himself through the enemy team! I began to panic and called to him in Skype. His response was utterly re-assuring. He simply said, “It’s ok… I have Flash.” BOOM! He used Flash to jump the wall over to wraiths where a Thresh lantern was waiting for him! It was such a miraculous escape that the casters actually said “you cannot beat SecurityMetrics’ mobility, it’s just too much.” They were right, we were much too mobile. We picked Dragon up on our way back to our base, and prepped for the final push. We grouped in bottom lane as we already had middle and top lane’s inhibitor. At this point it was a war of attrition. If we just stood in lane our creeps would win us the game. We could keep pressure up pretty well in bottom lane, and we did just that. Lux had some decent counter poke, but nothing to stop our team from sieging. Trinity Force helped with damage to turrets, but we almost didn’t need it. Everyone on team SecurityMetrics was stronger all around. I did get caught by a Lux Light Binding that she followed up with an ultimate. I definitely flinched because a combo like that has killed me before! It dropped me to just below 50%. I asked my team to let me lifesteal off the next creep wave, and that topped me all the way to full. We decided that the next wave would be the one we fought on. We weren’t afraid of going under their turret because our Jarvan IV still had Guardian Angel. We let him engage the enemy team, and we were able to jump in and burst down their Miss Fortune. I got to sit in the back and just pump out damage. The casters said “right-click to victory”, and it was almost that easy. I did have to Arcane Shift and land a Mystic Shot to pick up the last kill on Lux, but then we knew we had done it. We had achieved the impossible. We had managed a perfect season in the AHGL! It was a great season, one that will live in our memories for a long time and always be appreciated. After all of the practice, the preparation, the worry, the strategy, the planning, the blogging, we had managed to beat teams that we were extremely intimated by. A special thanks to everyone who organized the league and helped make it run smoothly. Another special thanks to all the teams in the AHGL. I had a great time playing and I hope that every other participant had as much fun as I did. GG.